A demo for the 13th official game in the Touhou doujin series , 「Touhou Shinreibyou ~ Ten Desires」, is now available for download below. According to the official website, ｢Reitaisai 8｣ has been rescheduled for May 8th, 2011 at Tokyo Big Sight. Originally the event was supposed to take place March 13th but was temporarily canceled due to the Tohoku 9.0 earthquake that occurred the same week. Earlier today, the 13th official game in the Touhou doujin series, entitled 「Touhou Shinreibyou ~ Ten Desires」, was announced by developer ZUN. As usual, a demo will be released at the next Reitaisai event, (March 13th). Reimu, Marisa, Sanae, and Youmu are all confirmed to be playable. No word on when the full version will be available. According to the latest blog post from game developer ZUN, a new title in the Touhou Project doujin series was formally announced — entitled 「Touhou 12.8 ~ The Great Fairy Wars」. 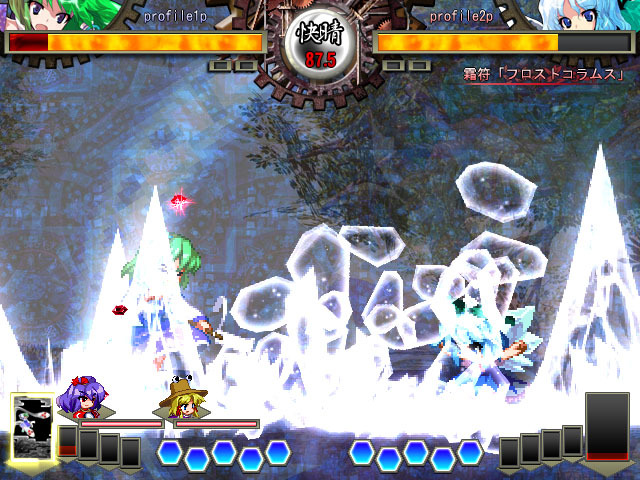 Touhou 12.5 – “Double Spoiler” Announced! If you had checked out the latest entry from ZUN’s blog earlier today, you would know that a new Shoot the Bullet-type game was announced. He states this will be much harder than the original StB. Also don’t expect any of the characters from the first StB to return in this one. Touhou 12.5, otherwise known as 「Double Spoiler ~ Touhou Bunkachou」, will be released fully on March 14th at Reitaisai 7 (1000 JPY). Tasogare Frontier has announced they will release their latest doujin fighter,「Touhou Hisoutensoku / 東方非想天則」, (TH12.3) at this year’s Comiket event, (August 14th-16th). The events in the game take place after 「Undefined Fantastic Object」 (TH12) — also due out at C76. To clear all confusion, this is an expansion to 「Scarlet Weather Rhapsody」. Playable characters Sanae, Cirno, and Meiling have all been confirmed. Sanae will be able to summon both Kanako and Suwako. The 12th official game in the Touhou series, entitled「Touhou Seirensen (Star-Lotus Ship) ~ Undefined Fantastic Object」, has been announced. As usual, a demo for the first 3 stages will be released at the next Reitaisai event, (March 8th). Reimu, Marisa, and Sanae will all be playable. Full version expected to arrive at this summer’s Comiket 76, (August 14-16). After months of rumors, a press release issued from Nintendo of America has officially announced that Studio Pixel’s action-adventure platformer「Cave Story」will be arriving for the WiiWare this coming holiday season. No specific release date yet, however, it was reported that the game will feature new exclusive content not found in the original freeware version.